This week we find the illustrious doom-lord EARTHDOG back in action. He hooks up with fellow canines DOOMDOGS from Sweden and gets the lowdown on their fuzzed out heavy doom metal/stoner rock action. 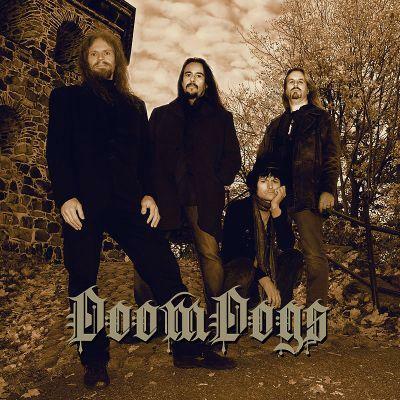 Guitarist CHRISTER CUNAT howls and growls about the Doomdogs' latest and greatest album "Unleash The Truth" and lets all you dog-lovers out there know just what these metal-crazed mutts have been up to. Jump into the pound and read the interview right HERE! More good interview news. I just journeyed beyond the black hole and grabbed a chat with sci-fi thrashers VEKTOR. Both ABSU and BRUTAL TRUTH are in the pipe and I can also say that we are working on interviews with German power metal gods PRIMAL FEAR and former BLACK SABBATH vocalist TONY MARTIN! Plus we got a shot at BLACK COBRA and WISHBONE ASH. So things are hopping on that front. BRAINSTORM "On The Spur Of The Moment"
GLORIOR BELLI "The Great Southern Darkness"
ORANGE GOBLIN "A Eulogy For the Damned"
NOX ARCANA "The Dark Tower"
MAAX "Unholy Rock N' Roll"
UNTIMELY DEMISE "City of Steel"